Friday night, September 14, 2018 – Brooklyn, NY – Rihanna was at Sephora inside JC Penney at the Kings Plaza Shopping Mall in Brooklyn to celebrate the one-year anniversary of the highly successful Fenty Beauty by Rihanna brand. Rihanna created Fenty Beauty “so that women everywhere would be included,” focusing on a wide range of traditionally hard-to-match skin tones, developing formulas that work for all skin types, and pinpointing universal shades. Her vision, above all, is to inspire: “Makeup is there for you to have fun with. It should never feel like pressure. It should never feel like a uniform. Feel free to take chances, and take risks, and dare to do something new or different.” Rihanna says. 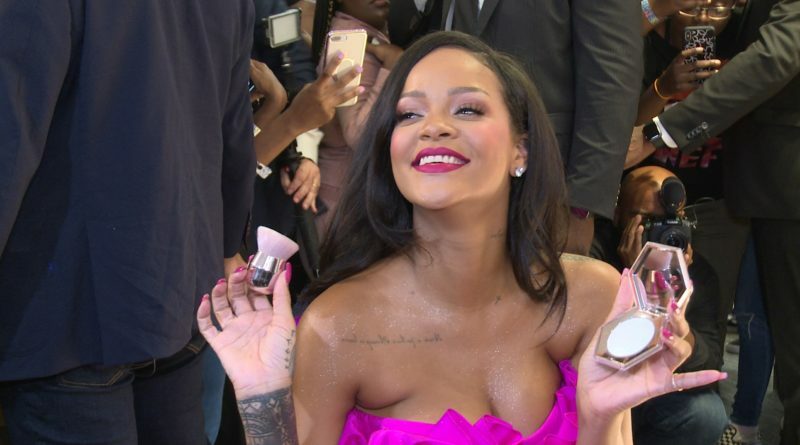 The special night included the launch of the highly anticipated Diamond Collection, which officially launches at Sephora, Harvey Nichols and fentybeauty.com this month. ← Jennifer Garner’s Peppermint Premiere – Like You Have Never Seen Her Before!